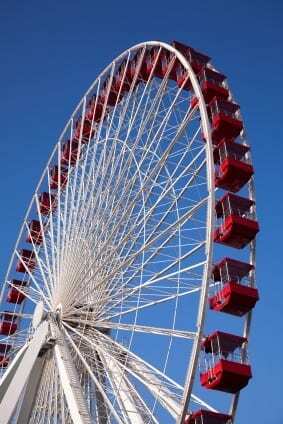 In a recent post from Writer Unboxed Author Robin LaFevers uses the ride of the Ferris wheel to encapsulate the ups and downs of the publishing world. I, on the other hand, am still in the queue, head tilted upwards with anticipation, nibbling on my nails. I’m watching the sun glint across the beaming faces of those on the side that’s rising. Do I even want to board? I feel safe with my feet planted firm on the ground. Plus I can hear the wails of those at the top – as they tip over the other side. The queue is not a completely hopeless stage to be at. It’s long and filled with interesting, talented writers from every walk of life. All of us, we can only go up from here. We have time to chat and wonder. We’re filled with hope and anticipation. Not that dreamy, disillusioned kind of hope of best-seller lists, red carpets and, well, potentially a Booker Prize down the track… Honestly, we’re easily delighted. Small accomplishments like when an article is accepted for publication, our name in print (even if mine is constantly squashed onto the back page below an Ad for Rufus The Magical Clown Party) and, most importantly of all, a pure connection with the writing itself. We have no pressures or deadlines. We can write when we like and about what we like – total creative freedom. The higher up we climb, the further the fall. The bar is raised, our goals bigger and more demanding, our tastes more expensive. And it shouldn’t stop us from reaching for our dreams, but we need to remember where we came from and what it was that captured us in the first place. There is simple pleasure in writing for the sake of writing. So, if I ever do make it onto that Ferris wheel, as I begin to rise with the sun glinting in my hair, I’ll make sure to keep glancing down at those still waiting in the queue – with their feet planted firm on the ground. Gemma Hawdon is a freelance writer living in Melbourne, Australia. She writes her own blog .